Did you know there was a new advert for a shop? Yes, the annual new Christmas ad for John Lewis is now an ‘event’ worthy of reporting by the media. £1 million for an animated 2 minute advert – that’s £8,333 per second. 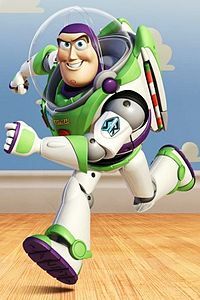 To put that in context, Toy Story 3 cost around $200m for 103 minutes – a mere £20,000 per second and they won 2 Oscars for that. Over 4.5 million in the first four days, more than their 2012 ad managed in total. But it’s not trending as fast as this cover of Daft Punk’s ‘Get Lucky’ by the Russian police. 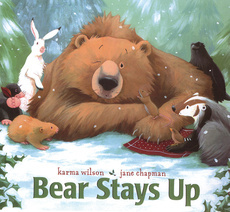 Of course they deny it, but as everyone who has read ‘Bear Stays up for Christmas‘ knows, the plot has been stolen. In the 24 hours after it was launched the ad was mentioned in 49,152 tweets, according to econsultancy. 58% of UK Twitter users and 9% of Facebook users had seen a mention of John Lewis in the first two days, according to YouGov. 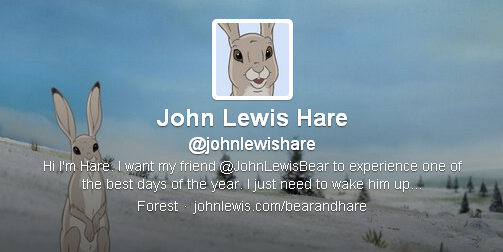 Should you be so inclined you can follow the hare and the bear on Twitter. Seriously. 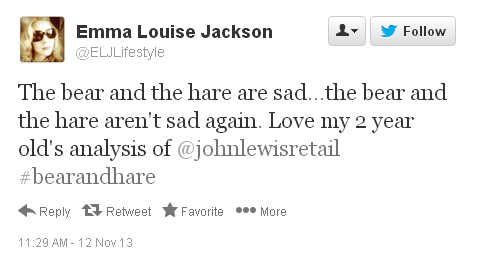 John Lewis paid £750,000 for the two-minute slot during X Factor. Twitter users complained that the ad was better than the programme itself.